1 of 4 In a bowl, whisk together all-purpose flour, almond flour and salt. In another bowl, beat butter and sugars for 2 minutes, until fluffy. Beat in egg and almond extract until just combined. Pour in flour mixture; beat until just combined. Work dough briefly with hands and form 2 disks. Wrap in plastic and refrigerate for 2 hours. 2 of 4 Heat oven to 375 degrees . Remove a dough disk from refrigerator. Generously flour work surface. Roll to 1/8-inch thickness. 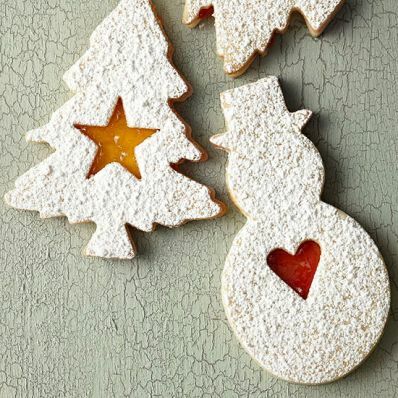 Cut out shapes (such as snowmen or Christmas trees) with a 3-inch cookie cutter; place on baking sheets 2 inches apart. On half the cookies, use a smaller cookie cutter to remove a different shape (such as a heart for snowmen or a star for trees). Re-roll dough as needed. Repeat with second dough disk. 3 of 4 Bake at 375 degrees for 10 to 12 minutes, until golden. Cool completely on a wire rack. 4 of 4 Separate cookies with cutouts from those without. Spread a scant teaspoon of preserves on non-cutout cookies. Dust cutout cookies with confectioners sugar and place on top of non-cutouts. Per Serving: 49 mg sodium, 1 g fiber, 3 g pro., 2 g sat. fat, 21 g carb., 7 g Fat, total, 18 mg chol., 151 kcal cal.